Quietly — but energetically, and with great excitement — an entirely new library is taking shape downtown. It’s got the same footprint, at the same wonderful riverside location. But that’s the only part that Westporters might recognize. Since arriving as executive director 14 months ago, Bill Harmer has been speaking with patrons, staff members and town officials. He learned that the 30-year-old facility is no longer state-of-the-art. Even worse, it’s ill-equipped to offer what 21st-century users want and need. 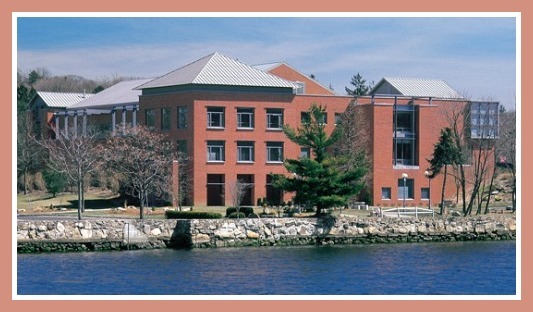 The Westport Library offers more than 1,700 programs a year. But there is only one real function area — the McManus Room — and with 140 seats, it’s sometimes too small. The Maker Space is a huge success, but noise often disturbs folks looking for quiet contemplation or study. The building lacks electrical outlets — a must in today’s wired world — and the HVAC, plumbing, elevators are failing. A previous plan would have involved a major renovation of the entire structure. 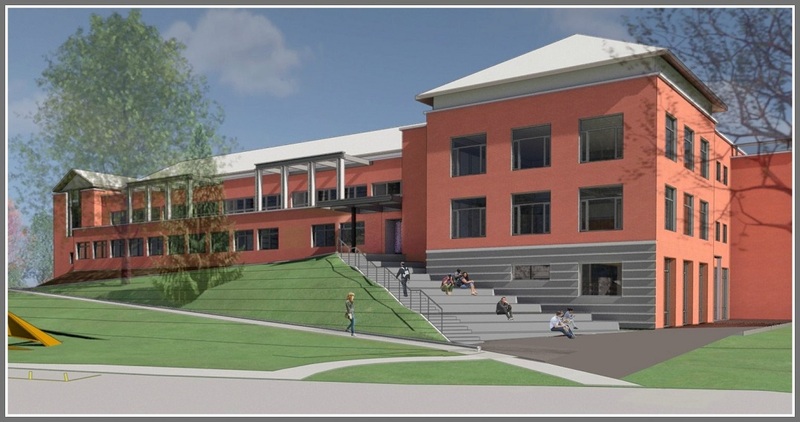 The new design will address all the challenges, creatively repurpose the building — and keep it open during the 2-year renovation. Best of all: It’s just half the cost of that earlier proposal. The new library design flips the current building upside down — figuratively speaking, of course. Harmer’s eyes light up as he describes the new design. “We’re going to flip the library upside down,” he says. Not literally, of course. But it might as well seem that way. Blowing out all the walls downstairs opens up 10,000 square feet of flexible space. That’s enough space for most of the books. New windows, natural light — and a new entrance — will connect people much more closely to the river right outside. The new lower level will take great advantage of the riverside views — and will contain most of the volumes now located one floor above. Removing the book stacks opens up enormous room on the main level. The new plan takes full advantage — with the added advantage of flexibility. The large “program space” accommodates up to 400 people — and includes a Times Square-like tiered grandstand, plus an LED screen behind the stage. Everything in the area is on wheels, for easy movement. That makes the newest addition to Westport’s public space also the most flexible. 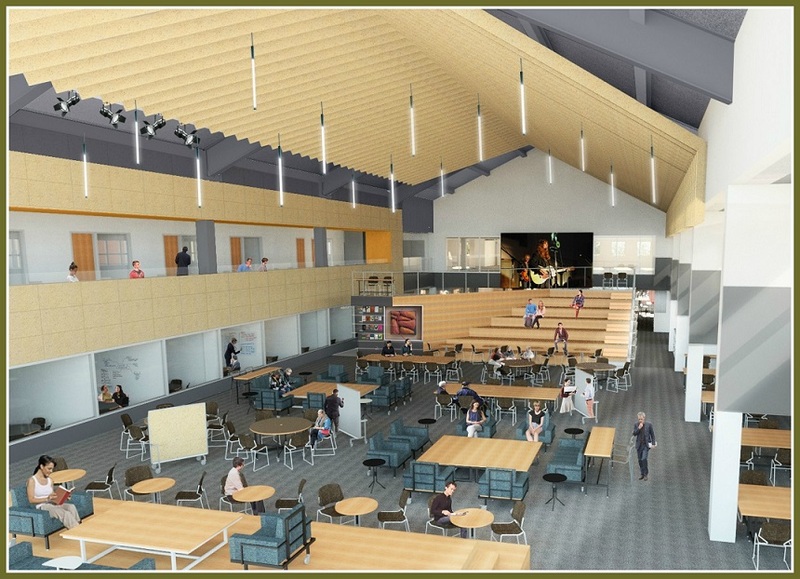 A “new” 130-seat McManus Room, a green room for presenters, several small- and medium-sized conference rooms, 7 small study rooms, an AV media lab, acoustic tiles and improved lighting are also planned for the main floor. The very popular MakerSpace, meanwhile, will be relocated — and becomes mobile. It can be moved anywhere in the library (as needed) from its new corner spot. Next to it is a “hacking space.” A laser cutter, lathes and other machinery will allow users to actually machine ideas they create in the MakerSpace. A separate entrance to that area allows it to be used 24/7. Harmer envisions this as an “incubation space” for makers, authors, or any needing after-hours access to computers, printers and other technology. He’s not aware of any library anywhere that offers anything like this. Oh, yes: There are plenty of electrical outlets everywhere. But that’s only part of what’s planned for the main level. The other side — “the Hub” — features a curated collection of popular books, Blu-rays and the like. A new entrance — fronting Jesup Green — will bring users directly into the main level, adding to what Harmer calls the “energy” of the Forum. A new Jesup Green entrance (with a handicap accessible ramp) will “activate” that area. It will also tie in with the parking spaces currently near the police station. 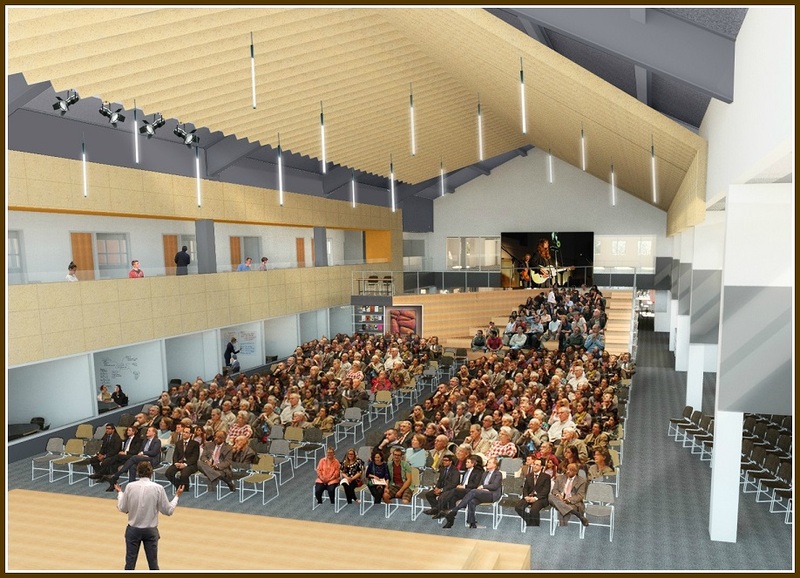 The large reading room in the northwest corner remains, but with more flexibility to accommodate 90 people for programs. 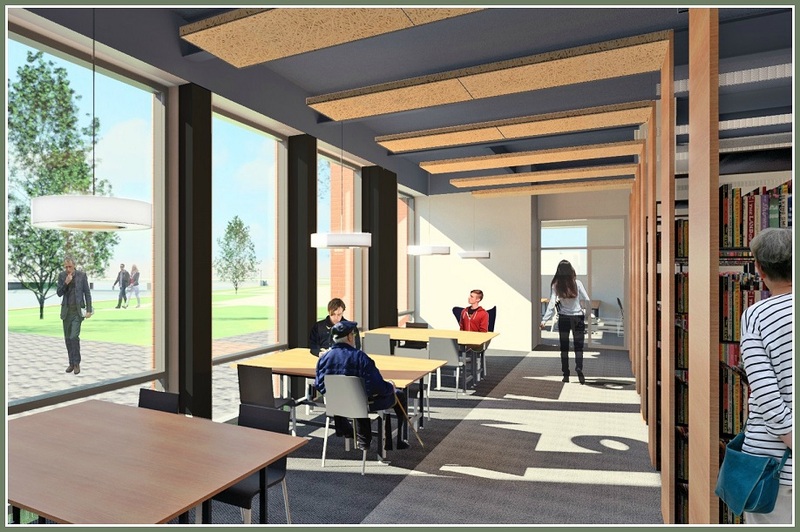 The smaller reading rooms will be renovated too — and their river views enhanced. The cafe will expand threefold. An outdoor terrace, and after-hours entrance, will add to its appeal. On the upper floor, the narrow balcony will be expanded by 5 feet. That allows up to 40 people to perch, looking out on the energy of the Great Hall. 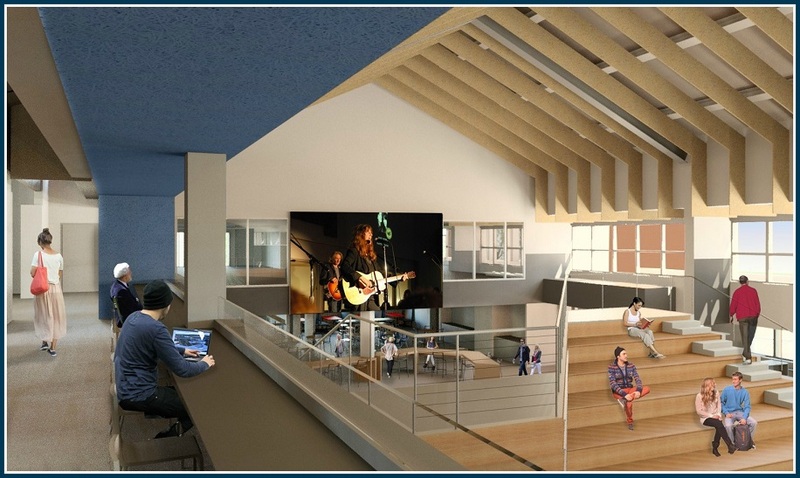 Expanding the 2nd floor balcony will allow users to “perch” over the Great Hall. Harmer and his board of trustees hoped to bring the new plan in for under $20 million. The current estimate is $19.5 million. They’ll ask the town to contribute $5 million — a figure that has been in the long-range capital budget for a while — while the other 75% will be raised by the library. For the past few months, Harmer has been talking to elected officials, and current and prospective donors. One thing won’t change: the footprint of the Westport Library. The Planning and Zoning Commission and Architectural Review Board both gave preliminary approval in June. The Downtown Plan Implementation Committee approved it unanimously. 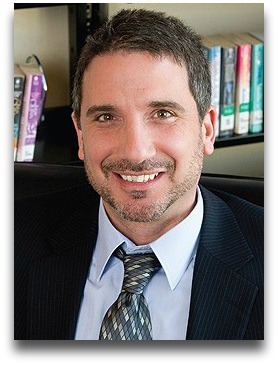 An initial meeting last week with the Board of Finance went well, Harmer says. He’ll ask for an appropriation in early November, following hoped-for final approval by the P&Z next month. Contracts are already in place with an architect, construction manager and owner’s agent. If all goes well — and so far it has — Harmer says there can be shovels in the ground next August. Construction would take 2 years. The library would remain open throughout — something that was also not possible in the previous plan. Exactly like the Westport Library itself. This entry was posted in Library, People, technology. Bookmark the permalink. unfortunate phrasing: the year I graduated from high school, or the year I was graduated from high school). … or ” the year I was granted a diploma”? Then again, is it “a” high school or “an” high school? What a pain in the English! What would Werner or Gerry say? Not knowing how to say “graduated from high school” goes hand in hand in a new world where public libraries free up space for people to use their electronic devices by…getting rid of the books! Very exciting for the library! Looks fantastic Bill – keep up the great work ! Looks like Westport will also then have a community center! I love the idea of a community space. The Library should be the center of town. How will all the books fit downstairs? Where will the A/V section go? Why not move the children’s section downstairs, so strollers can actually make it there without waiting for the elevator? Why not just expand the third floor the whole way across instead of just 5 feet? Great questions. Bill Harmer is in meetings this morning, but he will respond when he can. He’s got answers! As a longtime Library supporter and volunteer, this new plan strikes me as very dynamic and community-minded. I am eager to help make it happen! Is there space for art exhibits as they have now? I assume it’s in the plan somewhere but it wasn’t mentioned. Great ideas! Has anyone looked into the books on the first floor being safe from sea level rise flooding? One of Westport’s greatest treasures being updated for current and future technical advances, making it even more respensive to the community. Wonderful. Some public libraries now include experiential learning opportunities such as mason bee boxes on a quiet balcony! Serves double duty as an educational program and stewardship of the environment. Libraries have certainly evolved, so many possibilities! i am so excited. I am in our library at least once a week, if not more and am very proud of all it has to offer. and now it looks like it only going to get better! Wow! We are appreciative of all the positive feedback. Thank you for your questions. I’m happy to share with you that your questions resonate with the ideas and suggestions that have been forthcoming from many members of our community throughout the design process. The Library’s transformation plan is fueled by the needs and interests of Westport. We are also mindful of the need to optimize what we have available in terms of space, budget, and time. We are planning to host an open community forum at the Library later this fall, at which the project team, including the architect, construction manager, owner’s representative, and I will present the plans and address your questions in greater detail. An announcement of the date and time of the forum will be published on the Library website. I’m looking forward to seeing all of you there. Meanwhile, if you’d like to come in, say hello, and chat one on one, I’m always happy to talk about the Library. We’re excited about these plans, and so very grateful to the Westport community for all your feedback and support!